It had been quite a while since I had a chance to play a roguelike dungeon crawler. 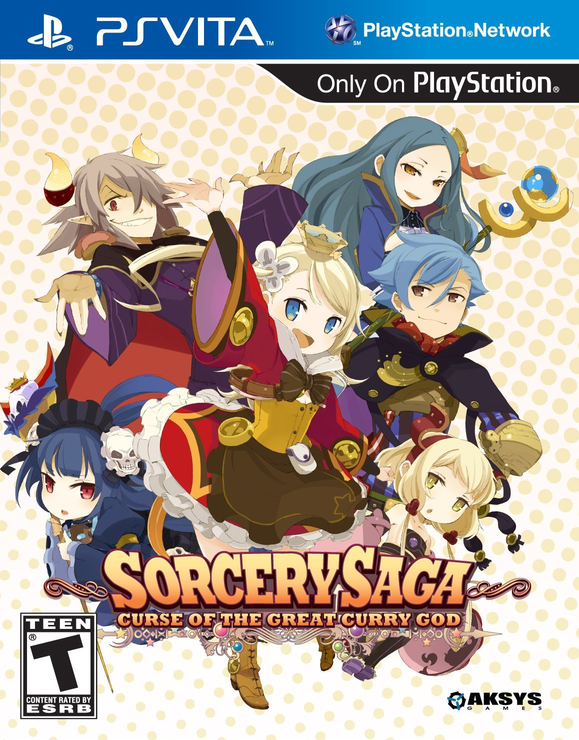 So, when I saw that Aksys Games was localizing Sorcery Saga, I was pretty stoked. Being a fan of Compile Heart; yep I said it and I am not ashamed, the over-the-top story and cutsey characters only added to my excitement for this title. Did it hold up to my expectations? Let’s find out! The story follows the young sorcery student named Pupuru. She is taking her final exam when some unfortunate events take place, and she finds herself suspended from school. Having tons of free time on her hands, she decides to hang out at her favorite curry restaurant, but a big chain restaurant has arrived in town, and is threatening to put it out of business. 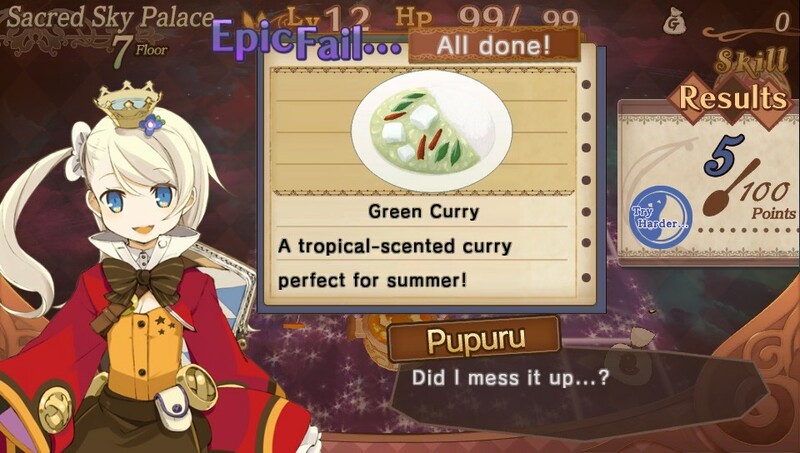 Pupuru sets out on an adventure to find the magical curry ingredients to make the perfect curry and save the her favorite restaurant. The story is pretty basic, but the characters are very well-written. This makes the situation comedy of the cutscenes really shine. Aksys Games did a really great job in the localization process. From the crazy antics of Puni detecting people’s curry auras to the desperate attempts of Gigadis to make Pupuru his wife, I found myself laughing out loud more than once at some of the zany fun taking place on-screen. You will even find some special items in the dungeons that unlock extra scenes in the Chara Theater. Graphically speaking, this one isn’t much to look at. The word “simple” comes to mind. All of the character designs and dungeon maps are very simple. Pupuru and all of the monsters are super deformed in-game. This could turn some people off, I suppose, but with a roguelike game, you’re here for gameplay more than anything else. The dungeon maps and areas have a few different looks, from the hot volcano interiors to the green forest, but, yet again, these are all pretty basic, as well. The artwork in the character cutscenes is very nicely done, though. The in-game music isn’t really bad, but there isn’t enough of it. There are a few very standard BGM tracks which change every so many floors you crawl through in the dungeon. Though I will say that the boss battle music is pretty good, and it even has some lyrics. Pupuru will spout out some one-liners in Japanese as she defeats enemies, opens chests and various other actions. Those of us that are fans of the Hyperdimension Neptunia series will recognize her voice quickly as Yui Ogura, or Rom. I thought she sounded really familiar for about the first hour of the game till I realized where I had heard that voice before. The monsters will say one-liners when they attack and are defeated, as well. The gameplay department is where this title really shines. This is about as classic of a roguelike dungeon crawler as you can get. The dungeon maps are grid-based, each move or attack will take up one turn. You will see all the monsters on-screen, so you will usually have a few moves to plan out a strategy for dealing with them. Sometimes you will come a across a surprise floor, which is never good for you. The effects of these floors vary from not being able to change equipment to having super fatigue, which I greatly hated because the enemies will get two turns to your one. You will also randomly run across monster houses, these are random places on the maps where monsters will spawn in all around you. Depending what kind of monsters they are, this could be a real problem. If you fall in a dungeon, you lose all of the items you have except the sword and shield you have equipped. You will suffer more penalties if Kuu is down when you are defeated. I personally never had this happen, so I don’t know what these are. Another thing to note here is this game autosaves, so, if something bad happens, you will be stuck with results. You can save on the world map or in town at any point you like. There is also an option to do a temporary save in the dungeons if you get tired. You will start back at that exact spot in the dungeon, but the save will be deleted once you load it. 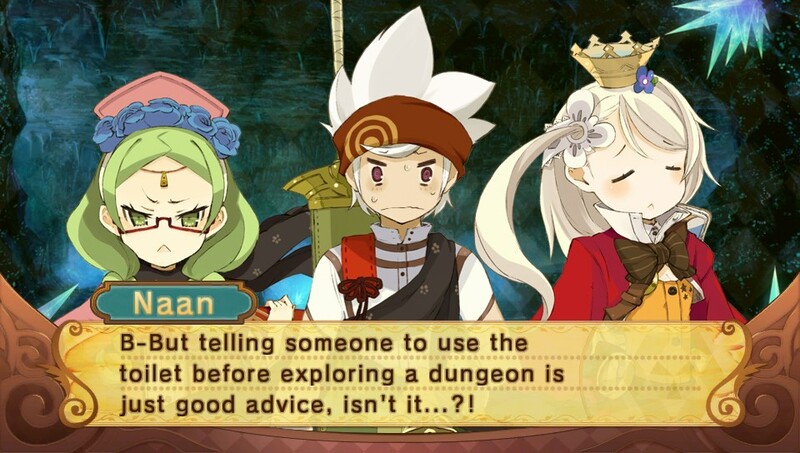 Speaking of Kuu, yep, Pupuru is not alone while crawling the dungeon. Kuu is a creature Pupuru encountered. He is CPU-controlled ally who will attack on-screen enemies, and gains many other useful skills as he levels up in the dungeons. Here is the catch though; he is always hungry. As you move around or he takes damage his fullness level will decrease. If his meter runs out, he will be KO’ed. Not to worry, though, as there is an easy way to fix this problem – just feed him some items. He can eat any item you pick up in the dungeon. These items will have different effects on him. Feeding him certain potions may boost his strength, while others may just fill up his fullness meter. This goes for weapons, shields or other food items, too. The town functions as the main hub. From here, you can visit the shops, upgrade your equipment and use various other services. You always start on Level 1 when going into a dungeon, but not to worry, you can level yourself up a bit through upgrading you sword and shield. As you find more weapons, shields and items, you can craft them to make your equipment more powerful. Basically, if you have a sword, and you put another sword into it that has a +1 on it, that will upgrade your sword. After some upgrading and using the same weapon for a while it will change into an entirely different weapon. As this happens, you will notice some empty slots under the weapon’s name, these are seal slots. Certain weapons, shields and items will have seals already on them. Combining them together into one piece of equipment will make it much more effective. For example, if your sword has an empty slot, and you happen to have a pickled onion, you can craft it into that weapon for a permanent +5 to your HP. This is the only way to better your stats, so you will want to think carefully when crafting your sword and shield. There are tons of different seals to be found on the hundreds of items. This is where you have to do a lot of experimenting, as the game doesn’t exactly tell you what items are good for what. Some items are best fed to Kuu, while others are best kept to be crafted or used as items. This can be a frustrating to start with, since you end up using a bunch of items the wrong way. 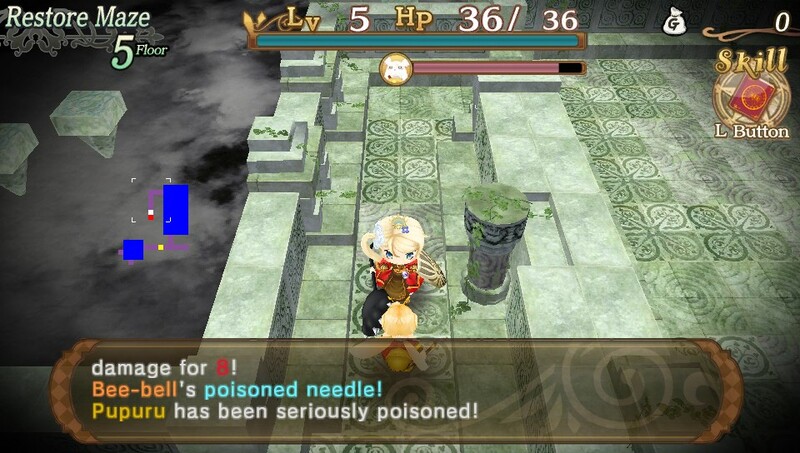 Another important skill you gain a little ways into the game is the ability to make curry instantly in the dungeon. You will gather up three different type of ingredients for the curry. You can make several different types of curry depending on the ingredients you have gathered, and each will have a slightly different effect than the other. 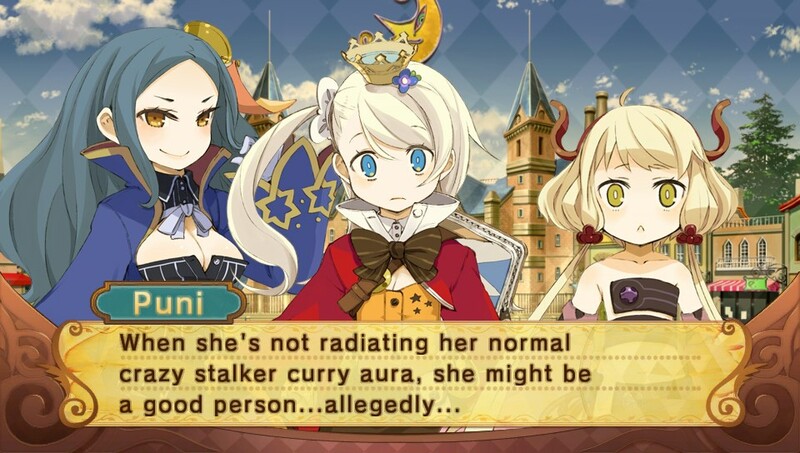 Eating the curry will give some temporary stat bonuses and some bonus EXP. This can really help you out in some of the tougher dungeons. I had a lot of fun with this title. It can be a bit repetitive, but the colorful environments, great characters and the hilarious story more than made up for it. Some of you may find the game a bit too easy once you have leveled up your equipment, but I found it fun to experiment with other equipment, and to grind for trophies. There is a good amount of post-game content, as well, in the form of one very restricted dungeon, and one very big one. In the end, if you like a good dungeon crawl on the go, I don’t see how you could go wrong with this one. If you are a fan of classic roguelike dungeon crawlers, you will find a lot to love here. For the price tag of $39.99, you get about 25 hours of main storyline content, and quite a bit more, if you want all the trophies. So, grab a spoon and dig into this one for some curry-filled fun! Game was reviewed with a code provided by the publisher for review purposes.